- Rugged design and Robust construction. - The entire cycle is automatic except for loading the job. SPS utilizes high amperage pulsed DC current to activate the consolidation and reaction-sintering of materials. An SPS system processes conductive, non-conductive and composite materials to any level of density. The clear benefit of SPS is the significant savings of time and energy and the ability to retain nano-structures. Toshniwal Instruments (Madras) Pvt. Ltd.
Our organization has successfully expanded its business in market owing to the offered elevated quality range of Sintering Machines. 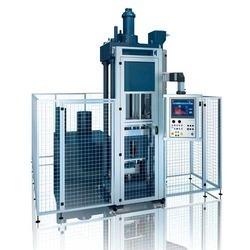 Sintering Hot PressMachine Sintering presses for single piece and volume production of diamond tools like dress­ing tools, Hollow drills, Honing tools, Saw segments and bit segments, etc. - The sintering machine perform well functions of formatting object from metal powder. - It heated metal powder below melting point. 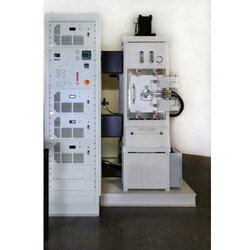 - Our sintering machines are easily adjusting the temperature according to your requirement. - It can automatically adjust the pressure, temperature and time. The Horizontal Tape Insulating & Sintering Machine perform well functions of formating object from metal powder. It heated metal powder below melting point. Our sintering machines are easily adjusting the temperature according to your requirement. Our range of Hot Sintering Press Machine HSP-75K/30T will sinter Metal Powder along with the Synthetic Industrial Diamond to make Diamond Tools, which are used for Various Stone Cuttings like - Marble, Granite, Limestones, etc. These Hot Sintering Press Machine HSP-75K/30T are available at most competitive prices. Simplex Engineering and Foundry Works was the first Indian company to introduce Japanese sintering technology in India. Induction heating has many advantages over conventional methods, such as radiant or conventional heating. Electronics Devices allows you to apply the latest induction heating techniques to your specific applications.